This article is going to teach you how to get absurdly strong. Way beyond 600 pound deadlift strong. I’m talking about work all day with a smile on your face, indefatigable strong. Climb up anything strong. Easily pick up heavy objects from awkward angles that would hurt others strong. The type of keen strength that can be communicated from a distance, and no one wants to mess with. You’re going to discover how to stimulate the billion-year-old DNA you’ve inherited by becoming more powerful, conditioned, and capable than most homo sapiens dare to fathom. In the process you’ll become more physical, more animal, more true to your nature, and less civilized. It doesn’t matter if you are male or female; elder or youth. It’s a human ability that lies within us all, and we’re going to wake it up from dormancy. You may put on muscle by following the principles embedded in this philosophy, yes, if muscle is what’s constraining your potential. But this isn’t a muscle building philosophy, nor is it more powerlifting dogma. Ironically enough, it’s an ahead-of-its-time philosophy that’s more ancient than any other – far wiser and more effective than any of the civilized and sterile teachings of strength you may be more familiar with. Once adopted and practiced consistently, your new way of training will put you on a trajectory where neural-charged, indestructible, integrated-mind-and-body primordial strength is yours, packaged in a higher vitality unbeknownst to modernity. So you can become the awesome human you were designed to be, and serve others while fully enjoying the experience of being alive because you are overflowing with vigor and spirit. Upon adopting this philosophy, you will shed mental and physical layers in order to become the animal that you were designed to be. You will look beyond the relatively modern culture of barbells, kettlebells, yoga mats, and even martial arts. You will see beyond the superficial appearance of strength and it’s false quantified, reduced version. You’ll finally taste first-hand the lithe, life-pulsing purity of strength in its authentic state. Our ancestors – especially those that lived beyond a few thousand years ago – knew that strength was essential for not only for physical, but spiritual growth. Its acquisition was simply a way of life; a necessity to remain a tuned and precise instrument; dangerous and connected to reality through the senses. By turning away from the slow bleed, numbing death of convenience, comfort, and safety, you too will understand what they knew and felt. Hang on though. The terrain is rugged, yet it’s the fertile ground of growing pure strength! That’s me, and every movement I chose to practice is something that directly ties to my ability to move – via locomotion, manipulation, and self-protection – through any environment. In fact, I take the insane strength (and other qualities) earned from this training and apply it to many other situations: from moving in wild, rugged environments (see below) to martial arts to daily more domesticated household tasks. The carry-over is limitless because the well of strength and toughness gained through this type of training is less focused on quantification and more focused on qualification. Meaning, the skills I practice directly qualify me to easily move beyond the walls of my training space and into the situations found in the world at large. Principle #1 – Keep the doors shut. If you think it, then it’s true. I could provide endless amounts of counter-examples to nullify these limiting beliefs, but that won’t change your mind. Here’s something more effective: The Spartans had a good solution for this annoying tendency of the mind to create fears and false barriers. They would teach their youth to envision their minds like a huge house, with many doors to many rooms. Certain doors, they would explain, need to stay shut. If you open them, you will succumb to fear or doubt and your performance (in life) will suffer greatly. In other words, opening pathways to perceived limitations is a habit in itself. Drop the habit of “opening doors” to your overly conceptual/analytical part of your brain and tap into the more visceral primordial part of your brain that is fearless, imaginative, creative, and assertive. By doing so, you’ll start to actualize the things you want to happen with zero hesitation or doubt. Further, use a similar tool top athletes employ: visualize yourself undergoing this training – with effortlessness – and truly live the feeling of being in that state of intense capability and energy. Live it constantly, and believe it’s who you are meant to be with your whole heart, then let your actions be an extension of that belief. Principle #2 – Be an Artist of Progress. Progress is a process. Say that 10 times fast. Your tongue and lips just got a little stronger! Resist the urge to just replicate the complex and demanding movements verbatim from the workout in the video you saw. Instead, learn how to understand how to reverse engineer the movements by breaking them into smaller pieces. In MovNat, we call this “deconstruction” and it’s what we spend a good deal of our certifications mastering. First, we get competent and strong at the components of a big movement, then we get good at the big movements and sequences when we are ready. The result of this process is far superior progress than just trying (and failing or flailing) a big movement sequence. I dub progress (or “progression”) an art because it requires creativity and imagination. Find the underlying patterns in the sequences, practice the various parts until strong and crisp, then assemble them into an imagined practical, real world sequence. If you can adopt these perceptive skills, you’ll empower yourself to be your own trainer and carry these skills into real situations with confidence. Principle #3 – Don’t fixate. Said plainly, your overall coordination and control are the drivers of your progress toward becoming ridiculously strong – contrary to popular belief, progress is NOT about being able to perform harder/heavier tasks. The more coordinated and in control of your mind-body organism in relation to your environment you become, the more strength will happen as a consequence of practice and progression. Coordination and control don’t happen by getting good at one thing though. It’s a synergy, a meshing of seemingly disparate skills that create powerful movement systems. Because these qualities happen in your brain – and, really, so does strength – they must be stimulated in a way that fosters never ending growth potential. For example, if you want to be able to make the Open Hand Power Up feel effortless, make sure you can do a Front Vault. These two movements might seem unrelated to the untrained eye, but the powerful “pull through” of the Front Vault is a vital component of the Power Up. That’s just one small example! So many get stuck in the rut of chasing back and forth after one movement, that they end up burying themselves in the narrow trench they dug. Don’t fall for the trap of fixation! 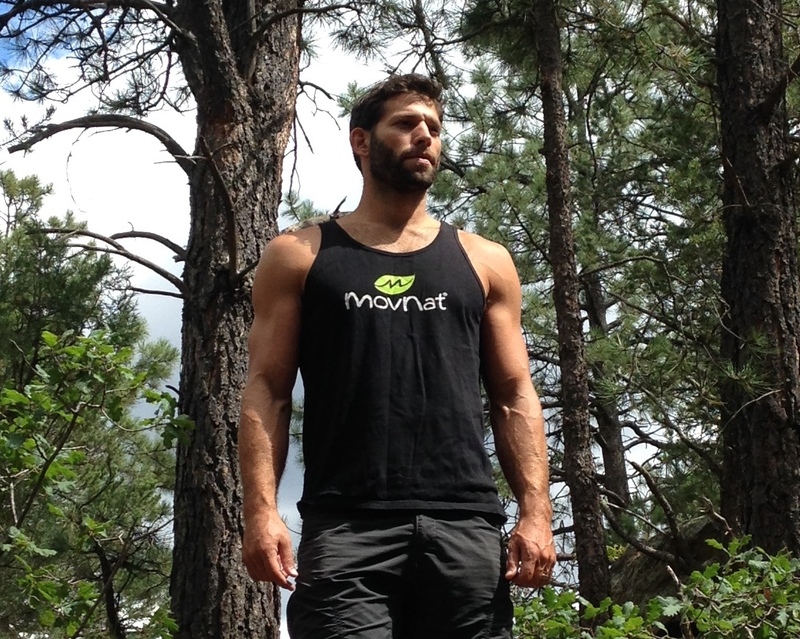 In MovNat, we practice the full spectrum of Natural Movement in the full spectrum of environments and situations. Thus, we enjoy the synergy of strength that arises from the breadth of the practice. Oftentimes, people will find a handful of movements difficult, and discover it’s really the same issue repeating itself over and over. With the perceptive eye gained from principle #2, you be able to spot those weaknesses and work on all the full spectrum of movements that address it, making progress more deliberate, rapid, and translatable to real world conditions. Below, you’ll find a few more strength-focused workouts you can start experimenting with. Don’t worry about the setting or equipment! We can cover building cool setups in another article, but don’t let that be an excuse to not start now. All you need are some weights (literally anything that is dense), something to hang on (anything, including a door jam), and some space (10 ft. is sufficient). Two sessions per week is sufficient. Three for those that have the time and durability to recover. Work with whatever component of the movement and load is appropriate for you. Note: Each session has an “Emphases” where you will focus on building strength/power, and a “Combo” where you will work on building conditioning (i.e., strength that endures). Some of these clips were made for Instagram – which is time constrained – so I don’t always film my full session. Hence, sessions #3 and #4 are Emphases and Combo pieced together from various sessions I’ve done. Each total practice session should take under 1 hour, or split into two ½ sessions over the course of the day (or, whatever works for your schedule!). Keep in mind – this is just the beginning! It’s up to you to overcome the mental barriers that excuse yourself from becoming ridiculously strong and living up to your highest self. May this article be the soils of progress. Want To Get Ridiculously Strong With Natural Movement? 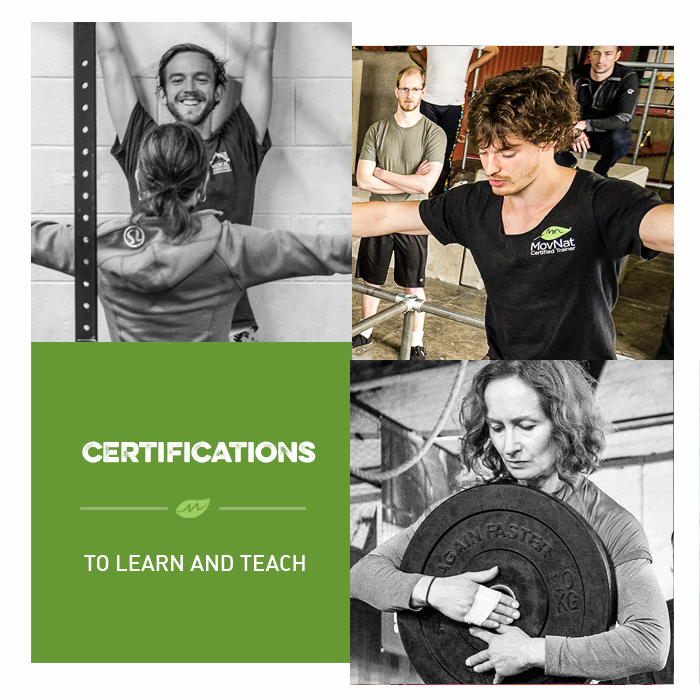 If you’d like to learn more about Natural Movement Fitness and get ridiculously strong in the process, consider attending the MovNat Level 1 Certification or a MovNat Workshop. We hold events all around the world. Or, find a MovNat Certified Trainer or Gym in your area. We also offer MovNat Online Coaching as an alternative to live instruction. Most people feel that they should be more physically active. Some even recognize the incredible value of natural movement training. But they struggle with actually implementing it into their daily lives. That’s why we work closely with people from all walks of life to help them move better, get healthier and stronger, and discover their true potential with natural movement fitness. It’s also why we work extensively with health and fitness professionals who understand the value of this new paradigm and are eager to start implementing it with their clients. This is fantastic! Many, many thanks for this article and accompanying videos. This article rocks (pardon the pun). I felt that even I was capable of moving towards some of the skills and strength so apparently effortlessly displayed. Thank you so much for the inspiration and the step-by-step breakdown. Hi Danny, thanks for the nice article! I’m curious: how did you build up to an over 600 pound deadlift? The deadlift is not a very high level skill so raw strength is needed. So you would have to look for heavier and heavier logs/ stones etc. to build the strength… doesn’t sound that practical. Hey Max. I personally don’t work toward a 600# deadlift. Its not that I couldn’t lift that much if I really had to…I just dont think its worth training for when there are so many other skills to acquire and getting better/stronger in. Capability is the goal for me. I think this is a great article and some of the best how-to content MovNat has put out in some time. If you are recommending that people start with 2-3 sessions per week, what do you recommend for “off” days? Would we be practicing more foundational skills throughout the day? As an aside, are there any plans to truly bring back the MODs a few days a week? Thanks again for the great content. This is truly great news!